Delivering professional-grade performance, the SanDisk Extreme PRO USB 3.0 Flash Drive offers a great way to securely store and quickly transfer high-res photos, movies, and other digital media. You can transfer files to the drive up to 60 times faster than standard USB 2.0 drives (1). Additionally, you can transfer a movie to the drive in seconds or 1,000 photos in under 35 seconds (2). Ideal for performance-oriented technology aficionados who like to share large media files without a long wait, the SanDisk Extreme PRO USB 3.0 Flash Drive provides read speeds of up to 260 MB/s and write speeds of up to 240 MB/s (1). Durable metal casing protects your files; fast transfer speeds let you share without the wait. Transfer a movie to the drive in seconds or 1,000 photos in under 35 seconds (2). Take your entire digital media library with you in your pocket using the SanDisk Extreme PRO USB 3.0 Flash Drive. This USB 3.0 drive provides a generous 128 GB of storage space (3), making it well suited for storing photos, movies, music, and other memory-intensive media files. Included with this product is SanDisk SecureAccess software, which provides 128-bit AES file encryption and allows you to password-protect selected files on the drive while leaving the remaining files accessible for viewing (4). The SanDisk Extreme PRO USB 3.0 Flash Drive is compatible with computers that run Windows XP, Windows Vista, Windows 7, Windows 8, or Mac OS X v10.5 or later (software download required for Mac, see www.sandisk.com/secureaccess) and that are equipped with a USB 3.0 or USB 2.0 port. (۱) Up to 240MB/s write speed to drive, up to 60 times faster than standard USB 2.0 drives (4MB/s); up to 260MB/s read speed. USB 3.0 port required. Based on internal testing; performance may be lower depending upon host device. 1MB=1,000,000 bytes. (2) Based on 1.2GB video transfer (MP4) and 3.6GB transfer of photos (avg. file 3.8MB) with USB 3.0 host device. Results may vary based on host device, file attributes and other factors. (3) 1GB=1,000,000,000 bytes. Actual user storage less. (4) Password protection uses 128-bit AES encryption and is supported by Windows XP, Windows Vista, Windows 7, Windows 8, and Mac OS X v10.5+ (software download required for Mac, see www.sandisk.com/secureaccess). 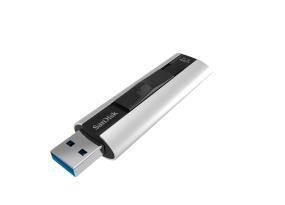 SanDisk Extreme PRO USB 3.0 Flash Drive with preloaded SanDisk SecureAccess software.